As you will now be aware the TRILOGY Range has become synonymous with Quality, Reliability and Outstanding Performance. These two feeder rods will only enhance this reputation. Incorporating the now proven Materials and Production Technology, used in the other products in the Trilogy range, we have once more produced a superb range of feeder blanks that have all the same attributes to ensure you get a high performance quality product. These rods are designed and purpose built for use on big rivers, they are not out of place on swollen fast pulling rivers in flood. The action of the blank gives the angler the ability to cast accurately yet retaining the necessary finesse to play fish without losing control. There are two rods in this new range. Firstly, a 13ft TRILOGY X FEEDER and secondly a 13ft 6 TRILOGY X FEEDER. 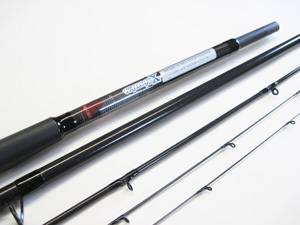 Both rods are supplied with two interchangeable Carbon Tips, colour coded for ID purposes and their individual C/W, giving anglers the option to choose the correct tip to suit their fishing and conditions. 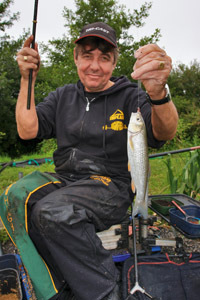 The 13ft Trilogy ‘X’ FEEDER is a Medium / Heavy Feeder rod, supplied with a 1 ¾ oz. and a 2oz C/W Carbon Push In tip. These tips are supplied with standard guides, purchase. The 13ft 6 Trilogy ‘X’ FEEDER is classed as a Heavy Feeder, incorporating a little more power in the middle section, which enables longer casting and using heavier feeder. This model is supplied with 2 Carbon Interchangeable Push in Tips, 3 ½ oz., & 4oz C/W. These tips are fitted as standard with large centre guides allowing shock leaders to be used when required. Both these rods are supplied with Quality Guides throughout, Graphite Winch Reel fitting, with a slim cork handle.